Ice and water shield is a material very different from the commonly used felt paper. It is however different in functionality and has superior capabilities when it comes to controlling leakages on your roof. For this reason, it has many more applications when it comes to roofing. Why do you need Ice and Water shield? While the traditional felt paper controls leakages under problematic shingles, ice and water shield is designed to do much more. It can handle more heavy duty tasks and address some of the felt paper shortcomings. Felt paper cannot handle certain situations such as when papers overlap. Here the water will find its way through the gaps. Ice and water shield is made of a rubberized asphalt mixture. Additionally, the material has a very sticky material that will work much better when overlapped with other similar papers. When you drive a nail through the roof to the felt paper, it will inevitably create a hole. This creates an area where water can get into the house. The ice and water shield solves this problem. The paper has rubberized material stretches when nail penetrates its surface. Since it has an adhesive backing, the material sticks to the nail and prevents any holes from forming. One of the biggest issues with the roof in very cold climates is ice dams. Not only are they damaging enough to cause problems with your roof, they can completely damage the underlying structure. Paper felts cannot solve the problem created by these ice dams. Ice and water shield, as the name suggests, is probably the only material that is designed to handle the irritating problem of ice dams. 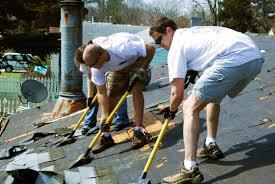 Most roofing companies will use it to seal problematic areas. The problematic areas that will be plagued by this phenomena include exterior doors, flanged windows, exterior rake edge, sill, eave, skylight, chimney, corners, ledger boards, deck joints, sky light, and low slope areas. Wind driven rains can also prove to be a real headache for homeowners. These winds push water under small spaces left by roofing materials. They make the water move in an abnormal direction. So even when the roof is properly installed, it can still cause leaks if you live in an area where hurricanes and severe thunderstorms are a normal occurrence. Just like ice dams you will need this material to protect your house from these storms. The materials can be applied to areas where the wind driven rain is most likely to cause leaks. These areas include places like the chimney, skylight, deck joints and areas on the roof that have a low slope. You may either choose to cover part of the roof with this material, or cover the entire roof. The latter option ensures that all areas are covered. However, this is not always necessary. A roofing expert can help you determine if you need to apply it on the entire roof. It is definitely possible for DIYers to do this completely without the help of an expert. It has a relatively steep learning curve since it must be applied directly as directed by the manufacturer. The rubber material can be very slippery, so you need to ensure that you apply the necessary caution. The best option is to get a professional roofing company to do it for you. You just need to make sure that the company has the necessary experience needed to do the job. The company has experts trained to do these types of tasks. They are well equipped with harnesses to prevent slipping and falling from the roof. Whichever option you choose, make sure it is the wise one. Written by True Son Exteriors, the best roofers Columbia, MO has to offer.